Make your own Easter basket for your cat. Cats love greens, so why not make them a custom Easter basket with wheat grass? Wheat grass is safe for cats to eat and grows quickly. All you need is a pot, some potting soil, cellophane wrap and wheat grass seeds. The seeds germinate quickly and if you plant about a week ahead of time you should have a full pot of grass for your cat to safely graze on just in time for Easter. As always, if you have questions about your cat, cat health or anything else please feel free to call us at 860-669-5721. Dakota is the patient of the month! 1. How did you come to live with your humans? Did you join them as a puppy or kitten or were you adopted as an adult? I came to my Mummy as an 8-week-old pup, but was already well-traveled by then: I was conceived in Europe (my Dad was a real STUD), and then my pregnant Mama was brought to California to join her own breeder’s family. I was born near LA, and my Mummy then brought me over to the East Coast by plane. 2. How did they choose your name? Haha. I have an awesome registered name. It’s Apache Spirit Dances with Wolves. Don’t you think that suits me? Mummy called me Dakota because she maintains that she can’t keep yelling “Apache Spirit! !” down the yard whenever she wants me to come inside. 3. What are your favorite activities? My ball. My ball. Throw it. Yes, all the way. Down the hill, and back again. Again, Mummy! Again! Daddee, mummy won’t play with me anymore. Daddee, throw my ball. Pleeze. 4. What is your favorite treat? Trader Joe’s mini party turkey meatballs. Yum. Without a doubt. Bacon, New York Strip Steak. Camembert. I have a very refined palate. 5. Do you have a favorite toy? My ball. Have I mentioned my ball yet? It’s orange. It’s the best thing, ever. 6. What do you like about coming to Clinton Vet? Argh. Oops, Dakota ran away when he saw this question, so this is Mummy’s voice here: my big, goofy boy is a wimp, and he’s convinced Dr. Natalie is out to kill him. But really, he’s also very forgiving, because he keeps going back in your door every time. He says that treats feature a lot, and that he really likes Dr. Natalie a lot, and that everyone is very kind to him, but mostly he’d prefer to just forget coming to you. Oh, Dakota’s back. He wants me to make sure that I say thank you to Dr. Natalie for all her patience, and for telling my Mummy to feed me more so that I’m not hungry all the time. I EAT A LOT! 7. Do you have any nicknames? I answer to Goof, and Floof, and Kota. 8. Any other fun info you’d like to share with us? Have I mentioned my ball? Oh, wait, another fun fact? I have my own business card! Mummy says people are always stopping her on the street to ask what breed I am, and because nobody has ever heard of the Berger Blanc Suisse, she decided to make up some cards that she carries with her to hand out. People seem to like that. I’m also a Canine Good Citizen, and I have a few ribbons to my name (not that I care). Thanks for reading about our patient of the month! Do you want your pet to be featured? You could also win a $100 gift certificate to Clinton Vet! Give us a call (860-669-5721) or ask us how to be entered at your next visit! Why bloodwork is an important part of your pet’s healthcare plan. During sick exams or visits. Bloodwork can help determine the cause of your pet’s illness. As a pre-anesthetic screening. Bloodwork helps us determine if it is safe for your pet to undergo anesthesia. If we note any problems we can also make adjustments if necessary. Preventive care or wellness visits. Pets can’t always tell us when they are sick. Preventive care or wellness bloodwork helps us uncover illness before it causes a problem and allows us to intervene early. Medication monitoring. Bloodwork is often performed to check the effectiveness or response to certain medications. It can also help us monitor how your pet is doing on certain medications. What tests are typically included in bloodwork? CBC– also known as a complete blood count. This test looks at white and red blood cells and can detect inflammation, infection, anemia and sometimes certain types of cancer. Chemistry profile- This test looks at organ function. It gives us an idea about how your pet’s liver, kidneys, pancreas and other organs are functioning. It also can help determine hydration status and blood sugar. Urinalysis- A urinalysis helps us monitor kidney function and can also detect inflammation or infection in the bladder or kidneys. Thyroid testing– Thyroid testing helps determine if the thyroid is functioning appropriately. Older dogs and cats frequently have thyroid disease. Cardiac BNP– This is a newer test that can help determine if the heart is functioning appropriately. This test is particularly important for cats who can have no murmur or outward signs of heart issues and still have significant heart disease. Three examples of why bloodwork is so important! Dexter came in as a very young puppy. He was having trouble with vomiting after eating. He was growing normally, was bright and alert and playful. However, since he was vomiting frequently after eating we decided to run some bloodwork on him. Even though he was under a year old, Dexter’s early bloodwork ultimately saved his life. Dexter’s chemistry panel revealed that his kidneys were not functioning normally, in fact they were shutting down. His urine sample also confirmed this and showed that there was some damage within the kidneys themselves. Dexter had kidney biopsies done and it was determined that he had a rare form of auto immune kidney disease. With the correct medication we were able to manage the disease and get Dexter feeling better. We monitor his bloodwork and urine every 4-6 months now to make sure there are no changes to his health and that his kidneys are maintaining normal function. Sherman is an older dog who came in for a dental cleaning. Sherman had pre anesthetic bloodwork performed which showed that his platelet count was very low. Platelets are needed for the blood to clot normally, so when they are low bleeding problems can occur. Sherman’s procedure was postponed since it would put him at increased risk of complications. We started him on medications to help increase his platelet count and re checked his CBC’s until his platelets were in a normal range. If bloodwork is abnormal prior to surgery it is important to know. Certain things may prevent your pet from having anesthesia or place them at an increased risk. Bloodwork helps determine that. Cutie is an older cat with a history of some vomiting. He was losing weight despite good control of his vomiting. His exam was pretty normal, he had a full ultrasound of his abdomen and nothing was detected. We ran bloodwork on Cutie that included a Pro BNP level. This level was determined to be extremely high, indicating heart disease. Cat’s can be very difficult to detect heart disease in sometimes. They can have no clinical signs or a murmur, and yet have significant heart issues. Cutie’s BNP indicated that he needed an echocardiogram or ultrasound of the heart. He is now on medications to treat his heart disease as well and will hopefully avoid issues that would have gone undetected due to his heart disease. My dog is limping, why? Dogs can become lame or limp for a various number of reasons. Unlike when we hurt ourselves though, they can’t tell us how they injured themselves or where it hurts. That is why taking your pet to your veterinarian when you see limping is important. Of course, there are different types of limping or issues that can cause these injuries and not all are emergencies. There can be acute vs. chronic types of limping and having your vet examine your pet can help narrow down why that limp is occurring. In general, if your pet has a more gradual, intermittent issue, this might be a more, chronic condition like hip dysplasia or arthritis. If your pet injures a paw or fractures a bone, you will see sudden limping. If you see a gradual onset limp or even an acute limp that doesn’t seem to be bothering your pet—these can most likely wait for normal veterinary hours and don’t need to be rushed to the emergency hospital. If your pet suddenly injures itself and exhibits signs such as swelling, dangling limbs, obvious fractures, ataxia or stumbling—these are more serious issues and should be addressed immediately. There are many causes of limping in dogs and limping can range from chronic conditions to acute trauma. We will go through five common causes of limping in dogs. Dogs have a very thick, specialized tissue on their paw pads but they can still get injuries to those areas. Foreign material such as glass, thorns, and nails, can become lodged into the paw pads and cause injury. Also, lacerations or burns to this area can cause acute limping as well. Injuries such as broken nails, infection from lacerations or wounds, or even issues like frostbite or sensitivity to salt on the ground during the winter can cause the paws to be sensitive and uncomfortable to walk on. You may see your pet holding up his paw or licking that area constantly and there may be blood or pus if the area is infected. These are all signs that your pet should be seen, they may need antibiotics and pain medications or wound cleaning/bandaging. We can also see limping or gait abnormalities when we are dealing with systemic illnesses such as tick-borne infections like lyme or autoimmune disease. These tend to be more gradual in onset, but we can see an acute onset as well. We frequently see other signs such as lethargy, decreased appetite, swelling of joints and fever. Some conditions that cause lameness can be due to injuries to the musculoskeletal system. Gradual wear or tear of ligaments or tendons or injuries within joints themselves can cause joint pain which leads to limping. Dogs can also have issues with the development of the elbow joint, specifically the cartilage in that joint. These tend to lead to arthritic changes within that joint. Even more common injuries involve the soft tissue structures of the joint. Dogs can get cranial cruciate ligament tears (like human ACLs), meniscal tears and luxating patellas (kneecaps). These injuries are seen daily in veterinary practice. With these injuries your dog will have hind end limping. They may be seen toe-touching with that hind foot or not fully bearing weight on the injured leg. An entire blog on one or two of these specific injuries will be available in the future since they are so very common. There are also diseases that affect the actual bones in your dog. Young, rapidly growing large breeds can have conditions such as panosteitis or hypertrophic dystrophy. Panosteitis can cause pressure within the bone and cause stimulation of pain receptors on the outside aspect of the bone. This leads to acute, limping in younger dogs that may shift from one leg to the other. Hypertrophic osteodystrophy can be seen in the front limbs of dogs. This is a non-infectious inflammation of the bone which can lead to swelling or bony growth in that area. There is bilateral swelling of front limb joints and this can be very painful. Limping in older dogs that involve the bones tend to be either osteoarthritis or bone cancer. Osteoarthritis affects the joints/cartilage and we can see chronic inflammation that can lead to a gradual lameness. Bone cancer such as osteosarcoma tends to a gradual onset with increasing pain in that certain limb. Traumatic injuries tend to be the most obvious causes of limping. These are the ones you see occur or can pinpoint the cause; car accidents, sports injuries, pets falling off the bed, etc. With these injuries, we see anything from fractured bones to soft tissue injuries. If you see your pet injure themselves and become lame after, keep them quiet and calm and wait a few minutes. If after a half hour your pet is still non-weight bearing or limping, you should bring them in to be seen by their vet. If an injury seems to be improving by itself, you can continue to monitor it and it may resolve without needing medical attention, but make it a point to strictly monitor your pet during that time. Sometimes the cause of the limping is glaringly obvious—glass in a paw pad or broken limb that is at an odd-angle and other times the cause is unknown. Your dog may need radiographs to help identify fractured bones, joint disease or other skeletal issues. Other tests like biopsies or joint fluid collection and blood tests to rule out tick illnesses or systemic issues may be needed. The treatment for all these different conditions varies greatly, which is why bringing your pet to the veterinarian is important. The treatment could be as simple as a few days rest with pain medication or it could require surgery, further imaging or testing or months of rehabilitation and recovery. Which is why in most limping cases, the sooner you bring your dog to see a vet, the better the prognosis! Peeing outside the box? 5 tips to avoid urinary problems in cats. One of the most common complaints we get from cat owners is that their cat is peeing outside the litter box. Inappropriate urination can be a sign of serious health problems in cats. So how do you know when peeing outside the litterbox is a problem and what can you do to fix it? In this blog, we are going to offer 5 tips to create litterbox harmony for your cat! The golden rule for litterbox happiness is to take your # of cats and add 1, this is the # of litterboxes that should be present in your house! If you have 3 cats, you should have 4 litter boxes. Even if you only have 1 cat, you really should have 2 litter boxes to avoid issues. If your cat is urinating outside the box this is the first place to start. Add additional litter boxes. If space is an issue I am a big fan of litterbox “furniture” such as the enclosures below. They allow you to hide the litter boxes and put them in areas where you may not want a litterbox visible. Clean the boxes every day! This is extremely important. At my house, it is the first thing I do every morning before I even have a cup of coffee. I let the dogs out and then clean out all the litter boxes. Cats are usually fastidious creatures and they prefer clean litterboxes. Many cats won’t use a litter box if it is dirty or smells bad. I also recommend completely emptying and bleaching out litterboxes every 3-4 weeks. This helps decrease odors and keep litter boxes clean. Cleaning the litter boxes every day also allows you to notice changes or trends. If your cat has not used the litterbox in a day, or if there are suddenly larger or smaller piles or urine this should prompt further investigation. Figure out what type of litter your cat prefers and stick with it. Sometimes people switch out litter types all the time or buy whatever is on sale and this can be a major stressor to cats and lead to litterbox avoidance. I use Arm and Hammer clumping litter, and I am also a fan of crystal litter. I have tried the corn and pine-based litters and my cats won’t use them so I stick with what they like. If you are going to try a new litter, always offer it side by side with the old litter. Don’t just change it out. This will allow you to determine if your cat will use it or not and won’t force them to use a litter they might not like. Make sure your litter box is large enough for your cat. Cats should be able to stand up and turn around in their litter box. For some larger cats, they will need a large or oversized litterbox. Two of my cats have a history of urinary tract problems and for them, they need a litterbox with high walls to avoid them peeing over the edges of the box. Some cats prefer covered boxes, but make sure that they can get in and out easily. For older cats finding a box that has a low side that is easy for them to step in and out of is critical. If your cat is suddenly peeing outside of the box or in inappropriate places around the house and you have addressed all the issues above consider trying to figure out what has changed and what might be stressing them out. Often times peeing outside the litter box is a behavioral issue that is triggered by stress. It can also be triggered by changes in the household such as new dogs, new cats or a new household member. It can also be triggered by cats outside the house who might be near windows where your cat can see them. Be mindful of all these things if your cat’s litterbox behavior changes. If stress is a trigger for inappropriate urination pheromones such a Feliway can help. Feliway is a natural pheromone that cats secrete when they are happy and relaxed. You can buy collars with the pheromones in them or diffusers. I recommend placing some of the diffusers around the house, particularly in areas where cats spend a lot of time. Last but not least, if your cat is suddenly urinating outside the litterbox have them checked out by your veterinarian. Crystals and other bladder problems may require medication or special diet changes and your veterinarian can help determine if these are needed. Have additional questions? Call us today- we are happy to help answer any litterbox questions you might have. 860-669-5721. The pancreas is a very important organ that is located on the right side of the abdomen next to the stomach. The pancreas produces enzymes to help break down food and hormones such as insulin, which helps regulate blood sugar. These enzymes are activated when food is ingested. When pancreatitis occurs, the digestive enzymes are activated before they reach the intestines and cause problems to the surrounding organs. Pancreatitis in our pets can be acute or chronic and can cause mild to severe clinical signs. 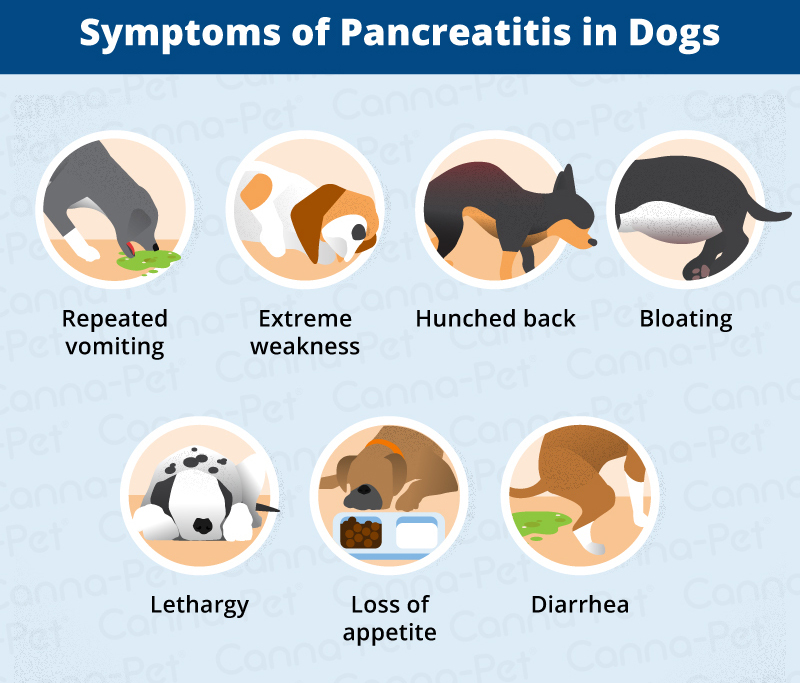 If your pet has chronic pancreatitis, we see flares of these episodes; where a pet will have symptoms, respond to medications and then recur months later. Most cases of pancreatitis in pets are idiopathic; meaning we don’t find the reason your pet develops this disease. Pancreatitis can be triggered by fatty meals or foods, certain medications such as steroids, endocrine diseases such as cushings or diabetes and/or trauma. There is a genetic link in specific breeds such as miniature schnauzers, where they have a genetic predisposition to developing the disease. Vomiting, nausea, decreased appetite, diarrhea, painful abdomen and lethargy are the most common symptoms. Some animals may present in a “prayer” position. In some severe cases some dogs and cats may need to be hospitalized due to the severity of the disease. In some cases pancreatitis can be fatal if not treated right away. There are a few blood tests that can be run to help diagnose pancreatitis. A complete blood cell count (CBC) can be done and may reveal an increase in the white blood cells. This is not 100% diagnostic though, since we can see this elevation due to other things as well. A chemistry panel that shows elevations in the pancreatic enzymes may be the most helpful test we perform. In some cases though, these enzymes may not be elevated. In this situation if we suspect pancreatitis may be the cause or want to have confirmation, an additional test can be done. This test is called the pancreas-specific lipase test. This test is very specific to pancreatic lipase and can be elevated in cases of pancreatitis. Also, ultrasound can be used to diagnose pancreatic inflammation or peritonitis (inflammation of the tissue in the abdomen). Sometimes though, even with all this testing, it may be difficult to diagnose pancreatitis and the diagnosis may be based on clinical signs and history. The severity of the disease and symptoms dictates the treatment. For more acute, less severe cases, getting animals on gastrointestinal medications, a bland diet, and some pain medication may be all it takes. This allows the pancreas to “rest” by not overwhelming it with fatty foods and protecting it with specific medications. For more severe cases, more extreme measures may need to be taken. Some animals will need to be hospitalized on intravenous fluids to rehydrate and correct electrolyte imbalances. They will be given intravenous medications to help with the inflammation and analgesics to help with the pain. Certain animals will need to be hospitalized anywhere from 2-4 days or even longer if patients are in systemic shock. Dogs that have less severity of disease and respond well to the medication prescribed should have a good prognosis. If the disease process is severe and patients don’t respond well to treatment or need to be hospitalized, the prognosis can be more guarded; especially animals who present in shock from the disease process. Overall though, most pancreatitis cases respond and do well. Dogs and cats that have recurrent bouts of pancreatitis are often put on a low fat prescription diet to minimize the risk of future flare ups. It is very important to bring your pet in if there is any change to their normal behavior at home. If you notice vomiting, lethargy, decreased appetite or any of the clinical signs listed above, bring your furry friend in! How do you prevent pancreatitis? Make sure you don’t feed your pet high fat meals and stick with your pet’s normal diet. People don’t realize that feeding your pet left over trimmings from Christmas dinner, foods with high butter content or any food that is a different fat content can affect them. Even though we feel we are giving them this as a treat or to show our love to them, it can be harmful. Love your pet with affection via brushing, snuggles, hiking/walks, throwing the ball or giving cat nip, but not by feeding them fatty human foods. This is a great way to keep your furry friends happy and healthy! Dental Health for your Pet! Dental health is extremely important! Dental problems can cause other health issues or be caused by underlying diseases. This is why having a yearly check-up for your pet is important. Your pet’s mouth, gums and teeth will be checked for early signs of dental issues. These can all be indicators of underlying periodontal disease and should be addressed sooner rather than later. Pets can develop some of the same issues that humans can get. We see gingivitis (inflammation of the gums), broken teeth, cysts or tumors, abscesses and much more. Periodontal disease is very common in pets and can develop at any age. Plaque can form on the surface of the teeth and this can harden into tartar–the cement-like material you can visually see on your dog’s teeth. The plaque that’s visible on the teeth can easily be removed, but its the plaque beneath the gum-line that can be concerning. This can lead to infection that can cause bone loss and tissue loss around those areas. Periodontal disease is graded on a scale from 0 (lowest) to 4 (highest). Its important to treat periodontal disease because it doesn’t just effect your pet’s mouth, it can have an effect on your pet’s heart, kidneys and liver. The treatment of periodontal disease is a thorough scaling of the teeth and may require dental x-rays. Also, some dental issues like severe fractures of teeth or the jaw bones, misalignment of the jaw, etc may need a visit to a specialized dentist for correction. Now you may realize why dental cleanings are so important to your pet’s health, but you may be wondering why does this procedure require anesthesia? As humans, when we go to the dentist we know why and what’s going to happen. We understand the importance of the visit. Our pets do not understand the procedures or know to sit still or not bite when someone is placing their hand or tools in their mouth. In order to make this procedure as stress-free, painless, and safe as possible anesthesia is required. Anesthesia allows your pet’s mouth to be thoroughly cleaned and assessed. Although anesthesia will always have risks, it’s safer now more than ever due to the equipment and monitoring used and in the end is the best way to clean your pet’s teeth. The benefits for your dog’s overall health, far outweigh the risks. How can I help my pet’s oral health at home? Regularly brushing your pet’s teeth at home allows manual removal of plaque that can form into tartar. This is the single most effective thing that you as pet owners can do to help prevent periodontal disease! Daily brushing is best, but life can get busy, so even brushing your pet’s teeth twice weekly is still beneficial. Brushing can reduce the frequency or even eliminate the need for dental cleanings. Start when your pet is young and train them to accept the teeth brushing. Here is a video below demonstrating how to brush your pet’s teeth at home! Keep it positive, keep it routine and keep your pet’s mouth healthy! February is National Dental Month, so mark your calendars and bring your dogs and cats into us for a full mouth assessment in January. The dental consult itself is at no cost in the month of January, and we can get your pet scheduled for its cleaning in February. All the dental procedures are 10% off! This is a great time to make sure your pet has a thorough dental cleaning and his/her mouth is as healthy as it can be. Call us to schedule your pet’s dental assessment today! You might be thinking, what is leptospirosis and how does it affect me or my pet? Let me explain. Leptosporosis is a life threatening disease that your pet can acquire from the environment. The bacteria that causes the disease is called Leptospira, and it can be spread through contaminated soil and water. The bacteria is also zoonotic, meaning it can be spread from animals to people. In people it can cause flu-like symptoms and it may cause issues with your liver and kidneys. We can acquire it from our pets if they are infected from the environment, but most human cases result from water activities. Dogs are more commonly infected than humans or cats. Disease in cats is rare and usually very mild. The most common exposure for dogs includes drinking from rivers, lakes or steams or spending time in grassy areas where wildlife and rodents are prevalent. Dogs can become infected and develop leptospirosis if their mucous membranes or any part of their skin with a scrape or cut comes in contact with urine, urine contaminated soil, water, food or bedding, a bite from an infected animal and/or eating infected carcasses. As you can see there are many ways for this bacteria to be spread to your dog! The signs of leptospirosis vary in dogs. They can not show any symptoms or become severely ill. Some signs to look out for in your pet are lethargy, fever, increased drinking/urinating, decreased eating, and/or painful muscles/joints. This disease can cause liver and kidney failure. It can also cause dogs to develop lung disease–so they may present with difficulty breathing. Rarely, leptospirosis can also cause bleeding disorders which may cause dogs to have blood tinged vomit, urine, saliva and possible nosebleeds. It is important if you are seeing any of these signs at home, to bring them to your vet right away. We can run blood tests and other diagnostics and hopefully get treatment initiated quickly to increase the chance of your pet recovering before too severe of an illness. Leptospirosis can hopefully be treated with antibiotics and aggressive fluid therapy, but it is important to try to catch this disease early on. If you are in any way concerned with how your pet is acting at home, bring them in for us to examine. There are vaccines available for leptospirosis. These vaccines effectively prevent leptospirosis and protect our dogs for at least 12 months. When first initiating the vaccine–it is a two part vaccine. Meaning they will be vaccinated once and then will be boostered in 3-4 weeks after. It is an annual vaccine after that and should be administered to any dog with the risk of exposure. Since we live in a rural area, with lots of wildlife and water sources, we recommend all dogs should be vaccinated. Even if your dog only goes outside to just go to the bathroom, that area could be contaminated with urine from an infected animal. Also, try as much as possible to prevent your pet from drinking from unknown water sources, stagnant water, and eating carcasses. Vaccinating as well as trying to decrease exposure to areas that could contain this bacteria are the keys to decreasing the risk of infection. This can be a very serious disease, but can easily be prevented with a vaccine. If your dog is not protected, make an appointment today! We can answer any questions you have and make sure your pet is protected from this disease. As the seasons change, your dog or cat’s skin may change as well. You may notice they have increased itching, biting at their feet/legs or overall seem more uncomfortable. We see atopy-or environmental allergies-in dogs quite frequently. The clinical signs range from a simple ear infection to major hair loss, scabs all along the body and them being severely uncomfortable. Atopic dermatitis is the inflammatory and chronic skin issue that’s associated with allergies. These allergies can be brought about by things in the environment that normally would be harmless—pollen, spores, molds, dust mites, etc. During certain seasons, we see these allergies intensify and see the clinical signs associated with them. The most common areas we see affected in our canine friends are; between their toes, ears, groin/inguinal region and sometimes across their backs. Environmental allergies can be genetically linked and even though we can see them in all breeds, there are specific breeds who tend to be affected more. We start to see these develop in dogs from 6 months and up. They have mild reactions when they are younger and we can see these intensify as they are older. We also see some dogs who have food allergies. Food allergies are less common than environmental allergies and any breed can develop them. We see food allergies manifest when dogs are younger and we see the same type of skin issues from these allergies as well. With food allergies we don’t see a change in symptoms with the season changes. The most common food allergies we see are to protein sources—with beef, pork and chicken being the top allergens. There are steps we can take to make your dog more comfortable and try to identify what is causing these reactions. Allergy testing can allow us to identify the specific allergens bothering your pet and help us come up with a plan for immunotherapy. Immunotherapy helps slowly build up your dog’s tolerance to these allergens and hopefully eventually decrease their reaction to them. If food allergies are suspected there are specific diets that we may start your pet on. Other things we can add to make your pet more comfortable on a daily basis are medications to helps with the itch, fatty acid supplements and adding antibiotics when we are dealing with a skin infection that flares up. It’s all about managing the itch from many different angles! A few medications to help with itch are apoquel, which is an oral medication and cytopoint which is an injection. Apoquel helps stop cytokines involved in the itch process and will provide relief against inflammation associated with atopic dermatitis. Cytopoint is the first long acting antibody injection that helps against atopic dermatitis. When or which medication we start with will depend on each individual patient. Both will help your pet with their itch! Also starting an omega 3 supplement helps protect the skin barrier against environmental allergens. If your are noticing signs of allergies and itchiness at home with your pet, make an appointment and lets discuss the next steps to make your pet less itchy. We can come up with a plan to help manage your dog’s allergies and make sure they are comfortable all year long! It’s time to think about your cats! Most people adopt kittens or young cats from shelters or friends. That is the perfect time to bring them into the vet and start a habit of veterinary care for them. Bringing your kitten or young cat in begins a positive relationship and allows the start of a discussion for future health care. This is the perfect opportunity to educate yourself on vaccine protocols, behaviors at home, interactions between multiple household cats and much more. This is also a great time to get your cat used to the carrier. Most people don’t bring their cat in until they are much older so being placed in a carrier and in the car and then arriving at a new place is an anxiety filled experience. If there is a reoccurring practice of coming in for multiple kitten vaccines and a positive interaction when they are younger, this will make any future experience to the vets easier. This is also a good time to discuss lifestyle of your cat. Are they going to be indoor or outdoor or even both? Most people believe since their indoor cat does not go outside, they are not exposed to fleas, ticks or mosquitoes. This is not true. So having even your indoor cat on monthly preventatives is important. These are just some examples of what could be discussed at an early vet visit to make sure your cat has a healthy, long future. People tend to think of cats as smaller versions of their canine friends. However, cats interact with us and each other much differently than dogs. Dogs are more social, pack animals who crave attention while cats are more independent. Dogs will be happy being walked or being allowed to sniff around outside while cats love high perches where they can have the vantage point, and tight spaces where they can be alone. Don’t get me wrong, there are some cats who love to be walked outside to sniff around as well! There are specific behavior cues such as inappropriate urination or marking behaviors which may indicate stressors in the environment. Multi-cat households should have multiple liter boxes–one more than the number of cats. Cleaning out the boxes daily is also a good way to decrease stress in the household. This is also a good time to bring your cat in to discuss these issues to rule out any medical reasons for that inappropriate elimination. Some cats who are older and may being dealing with arthritic issues, may have inappropriate elimination just due to height and location of the litter box. The box may be in a place that is difficult for them to get to–going down flights of steps to the basement for example. Or if the box itself has higher edges, this may be difficult for your cat to comfortably get into, hence the elimination outside the box. Also, just paying attention to daily eating/drinking and elimination habits can tell you a lot about your cats health. If your cat misses a few meals this could lead to serious issues whereas if your dog missed a meal, they could recover quickly. So being aware if your cat is eating and drinking normally and having normal urinary/bowel movements is very important. Sadly, we as veterinarians don’t always see cats until they are older and their health issues are too severe. We tend to see them when they are sick and owners are ready to put them down. We don’t want to just see your cat at end of life, we want to see them every year! If cats were brought in on an annual basis so we could track weight, body condition, discuss new or odd behaviors at home this would allow us to intervene much quicker and hopefully extend your pets life. There has to be a change with how we view and value our feline pets. Since they can be more independent, stoic and easily left to their own devices, it can be easy to overlook medical/behavioral issues that may be occurring. If we understand that yearly exams and blood work (as they become older) are important tools to help diagnose and keep track of future issues, then making those yearly appointments makes more sense. That way, we as a veterinary family can make sure your feline family members are the healthiest they can be. "Not a fault to be had! Wonderful & caring staff! Your pet will be well cared for!!" "I got a same day appt when I called in the morning. Dr Price found the cause and discussed treatment options. By the next morning my cat was his old self. Great staff! "—Paula H.
"Dr. Santelli has been wonderful helping us decode Kohl's allergies since we adopted him last month. We have not had experience with the immunotherapy injections we chose to treat with and she has always welcomed questions and has great feedback. "—Jessica B.
Clinton Veterinary Hospital welcomes your calls and your face-to-face visits. We want you to be informed before, during, and after any interaction with us. Copyright © 2019 Clinton Veterinary Hospital. All rights reserved.